Acquired from the collection of Count Nostitz of Prague. Tazza; variegated agate, green, red grey, etc. ; three sided, pecten shell in low relief on each side; short stem with gold band enamelled black and white; circular foot with narrow gold mount enamelled with scrolls in black and green. Origin: Attributed to Milan or Florence; second half of 16th century. Provenance: Collection of Count Nostitz, Prague. Commentary: The shape of this tazza is rare, but in the vocabulary of Mannerist ornament the triangular form was important and was especially popular in Italy during the sixteenth century. Even from the beginning of the century the Paduan workshops of the major bronze sculptors, Severo da Ravenna and Desiderio da Firenze, were producing numerous triangular containers - inkwells, sandboxes, lamps, etc. Many of these have hitherto been attributed to the hand of Riccio, who died at Padua in 1532, by which time the leading maiolica potter of Urbino, Francesco Xanto Avelli, was making triangular salt-cellars, as the examples in the Berlin Kunstgewerbe Museum and the British Museum conclusively prove (Wixon 1975, nos 94 and 99; Hausmann 1972, no. 198; Wilson and Collins 1987, no. 74). Indeed, during the second half of the century both the Fontana and Patanazzi maiolica workshops in Urbino were using the form for large wine-coolers, basins and even for the plinths of tall vases (see H. Tait, Ormolu-mounted Maiolica of the Renaissance, in ‘Italian Renaissance Pottery’, ed. T. Wilson, British Museum, 1991, pp. 267-78, figs 1-3). Most significantly, the grand ducal workshops of the Medici Court in Florence favoured the triangular form for some of their most sophisticated pieces that were destined for the Tribuna (the central room of the gallery built by Buontalenti above the Uffizi Palace and finished in 1589); for example, the beautifully carved lapis-lazuli standing salt (H. 18 cm), with its elegant silver-gilt mounts, has three sides of equal length and tapers upwards to a point (Palazzo Pitti, Florence, inv. no. 692; Kirsten Aschengreen Piacenti, ‘Il Museo degli Argenti’, Milan, 1967, p. 139, no. 192; Kirsten Aschengreen Piacenti, ‘Capolavori del Museo degli Argenti’, Florence, 1969, pp. 66-7, col. pl.). The fluted upper section can be removed like a cover to reveal a hollowed-out cavity (presumably for the salt) in the urn-shaped lower section. The spread of this fashion for triangular salts to Germany in the Renaissance is poorly documented; but for a discussion of two documented silver examples, together with some nineteenth-century pastiches, see the previous volume (Hugh Tait, ‘Catalogue of the Waddesdon Bequest in the British Museum: Vol. II. The Silver Plate’, London, 1988, pp. 306-10, no. 58, figs 330-4). The triple scallop-shell motif can also be found carved in lapis-lazuli among the Medici collections preserved in the Museo degli Argenti at the Pitti Palace in Florence (Piacenti 1967, p. 131, no. 19; H. 11 cm, DIAM. 23 cm; also, C. Willemijn Fock, Vases en lapis-lazuli des Collections Médicéennes du seizième siècle, ‘Münchner Jahrbuch der bildenden Kunst’, vol. XXVII, N.F., 1976, pp. 143-4, fig. 27). This tazza was related by Dr Fock to an entry in the Medici archives of 1595 (4 September), in which it was recorded that, on the orders of the Grand Duke, this triple-shell item of lapis-lazuli was to be handed over to Hans Domes for mounting in gold, but four years later when it was returned to the Guardaroba the work had still not been carried out. The shallow bowl of this lapis-lazuli tazza has been created by arranging the three scallop shells horizontally (with their shells radiating outwards from the centre) and so creating a trilobed tazza. However, another 'vase de lapis' - as it was described in the 1661 Inventory of Cardinal Mazarin's collection - has survived complete with its cover in the Galerie d'Apollon of the Louvre (inv. no. MR. 265; see D. Alcouffe, The Collection of Cardinal Mazarin’s Gems, ‘Burlington Magazine’, CXVI, 1974, p. 517, no. 313, fig. 20). In its deep bowl, short baluster stem and small foot it is most strikingly comparable to the London agate tazza. Not only the cover but also the sides are carved with the large scallop-shell motif, and on the sides each carved scallop shell is vertically suspended, as it were, from the rim - in exactly the same manner as on the London agate tazza. The Cardinal Mazarin covered cup and cover (inv. no. MR. 265) - along with another, but smaller, lapis-lazuli cup with gold mounts on the foot-rim and stem) which is trilobed in form and has also been preserved in the Galerie d'Apollon -is reliably attributed to an Italian workshop, probably in Florence, towards the end of the sixteenth century. The former attribution of this agate tazza (in Read 1902 and Dalton 1927) to a German workshop, therefore, has not been followed in this volume, especially as none of the known documented pieces of German origin correspond in the same way. The enamelled gold mount on the foot-rim is, perhaps, misleading, for its German appearance is familiar; but on closer examination its workmanship (including the rounded form of the outer rim) is remarkably inferior. Technically the quality of the enamelling is poor, but, even more significantly, the drawing and engraving of the scroll design are flaccid and uncharacteristic of the Court workshops of the period. Not only should the flat upper rim of the mount be horizontal and flush with the level of the polished hardstone foot, but it should also be enamelled - as is conclusively proved by the many German examples in the Hapsburg Schatzkammer (see ‘Prag um 1600: Kunst und Kultur am Hofe Kaiser Rudolfs II’, Kunsthistorisches Museum, I and II, Vienna, 1988, nos 365-70, 693, 695, 698-701), and, perhaps even more significantly, by the very similar moss-agate tazza in the Kunstkammer of the Hesse-Kassel Court, which has enamelled silver-gilt mounts on the foot-rim and on the stem above the knop (see Eva Link, ‘Die Landgräfliche Kunstkammer, Kassel’, Kassel, 1974, p. 21, with col. pl.). 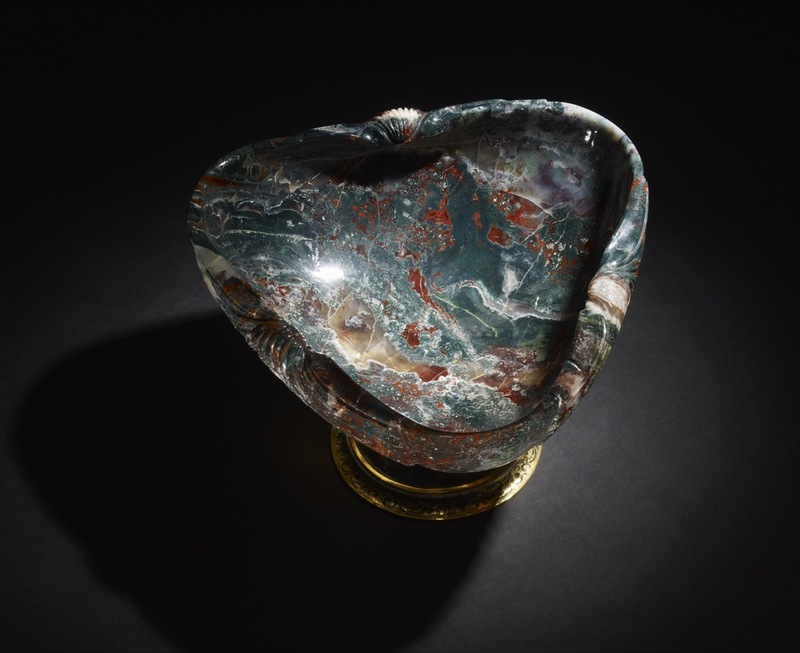 In the case of the London agate tazza the mount is ill-fitting, being higher than the polished hardstone foot, and that border is both too narrow and without enamelled decoration. Once this distracting mount can be dismissed as a later addition, the three-sided tazza itself can be seen as a rare and highly accomplished Mannerist object from an Italian workshop towards the end of the sixteenth century. Hugh Tait, 'Catalogue of the Waddesdon Bequest in the British Museum. III. The Curiosities', British Museum, London, 1991, no.17, figs. 223-224.